Famous people born on FEBRUARY 29 should wear colors that bring out the best in them. Some shades in particular make them look rich and elegant. They look fantastic as they maintain a healthy lifestyle. They get the proper amount of rest and exercise. As a lover, the February 29 celebrities have a way of sweeping their partner off his or her feet. However, they are sensitive people and may need to protect their heart. They have a strong attachment to their family and make long lasting friendships. As a Pisces, famous people born on February 29 tend not to favor rules and regulations. They like their freedom. They are known to change their mind in midstream. Nonetheless, they are good people and are willing to lend a helping hand even to a stranger. It’s easy to do. As they treat others as they want to be treated. Not many people do that these days so they are naturally a motivation to others. 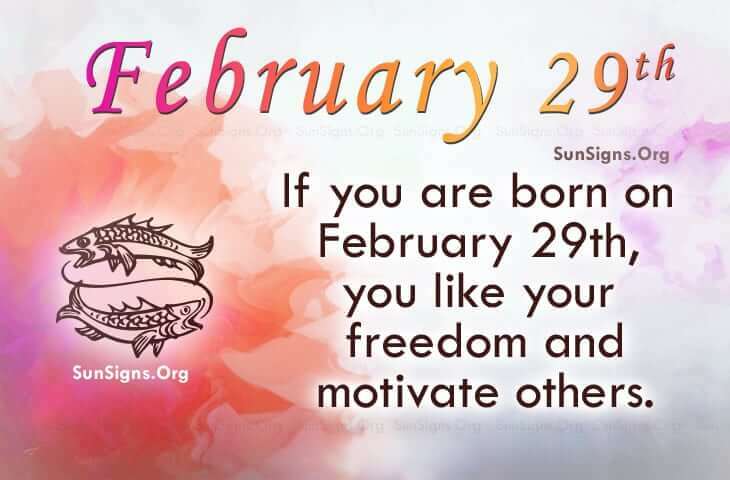 If you share the famous birthdays of FEBRUARY 29th, you have compassion for people. This makes you exceptionally inspirational. Sometimes, they can be feisty nor do they like commitments. They are likely to make friends with ease but have an idealistic view of romance.